Q: I was watching an old episode of “Dexter” from season one and was thrilled to see Tony Goldwyn as a guest star that episode. What has he been doing lately? I know he’s done a lot of behind-the-scenes work, but I’d love to see his handsome face on screen soon. — Ginger F., Madison, Wisc. A: Well, you won’t have to wait too long, Ginger, because Tony is one of the stars of the new ABC drama “Scandal.” The show centers on Olivia Pope (played by Kerry Washington), a former communications director to the president of the United States (Tony Goldwyn), who left the White House to open her own prominent crisis-management firm. She’s hoping to start a new chapter in her life — both professionally and personally — but she can’t seem to completely cut ties with her past. 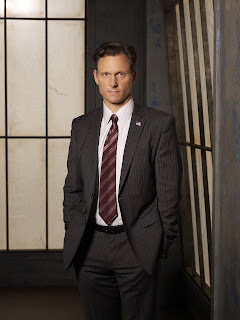 “Scandal” premieres Thursday, April 5, at 10 p.m. ET. With the show’s creator and executive producer being Shonda Rhimes, who also is behind the powerhouse series “Grey’s Anatomy,” you can bet there will be plenty of edge-of-your-seat drama to keep you coming back each week. A: Jack Bauer himself, Kiefer Sutherland, told reporters at a Television Critics Association press event about the planned movie: “Hopefully we’ll begin shooting at the end of April, beginning of May.” So, while that’s about all the details anyone can offer at this point, at least it’s something, and if we cross our fingers, maybe this movie will see the light of day by fall 2012 or early 2013. A: Those rumors are not rumors, Steve. They are cold, hard facts: Van Halen, with David Lee Roth, is back with a new album and upcoming tour. The album is called “A Different Kind of Truth” and will be released Feb. 7, with the debut single, “Tattoo” already getting airplay. The band starts touring Feb. 18, so check online to see when they are coming to your town. Hopefully they’ll stay friendly with each other long enough to complete the tour this time.